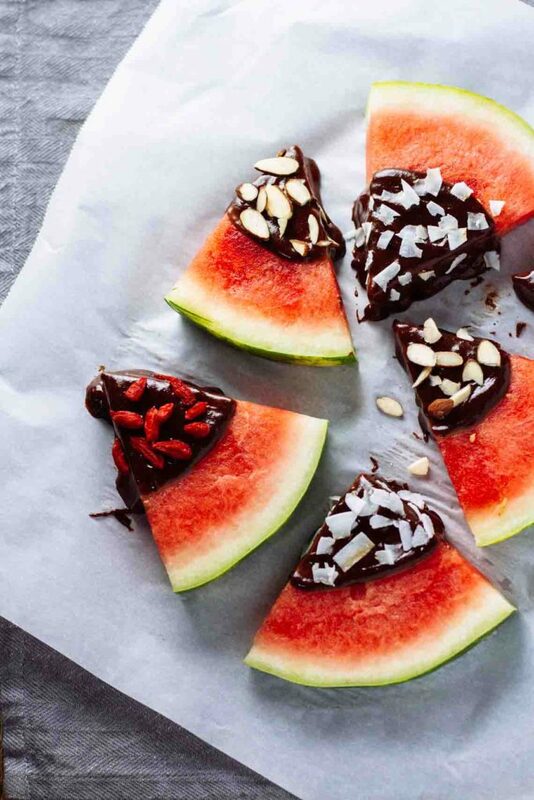 Chocolate-Dipped Watermelon Tastes Even Better Than It Sounds! Sometimes a simple recipe can be a revelation. This is one of those times. 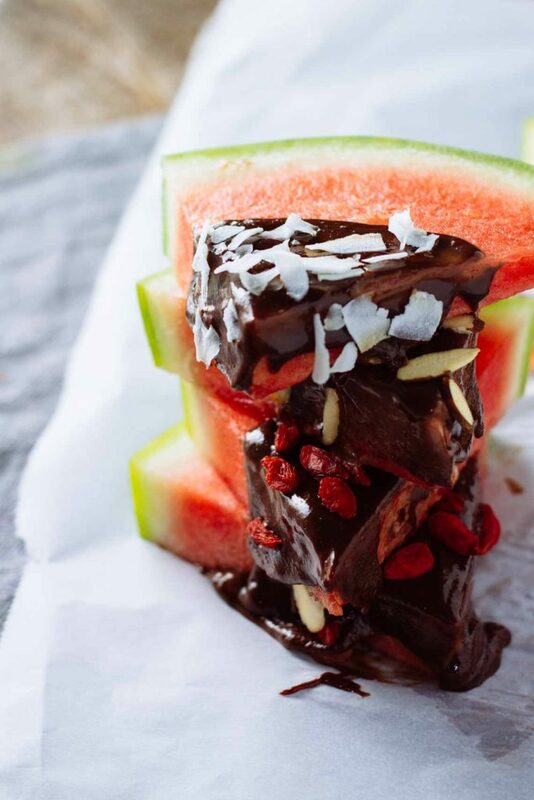 Sweet, fresh watermelon wedges dipped in nutty chocolate is not a combination we would have ever come up with on our own, but it is fantastic. As featured on the Jar of Lemons blog, this recipe takes watermelon to a place we’ve never imagined. We’ve heard of cheese, or chili, or salt on melon. The salt and spice make a delightful flavor contrast. But pairing chocolate and sweet melon is a new twist for us. As a bonus, this dessert is vegan and gluten-free, but we would love these refreshing, complex slices of heaven even if they weren’t. Toppings: chopped nuts or pepitas, shredded coconut, dried fruit. Make sure you have a ripe, seedless watermelon. Slice into wedges small enough to hold in one hand. 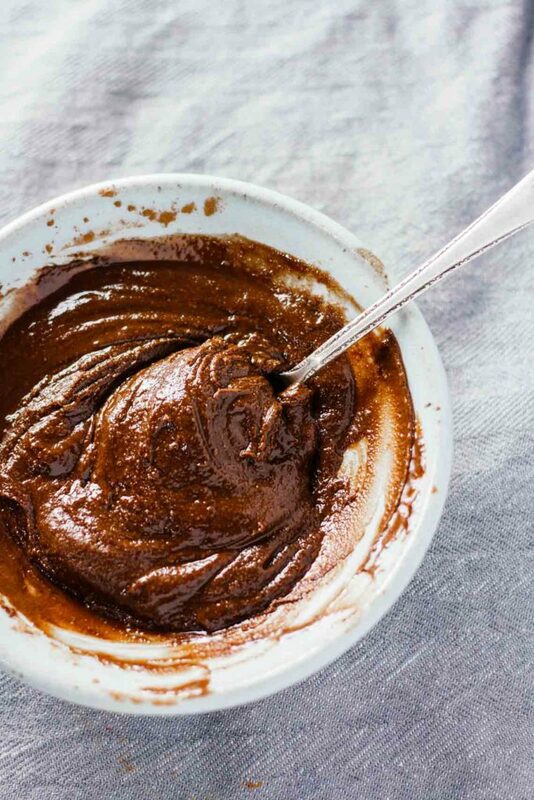 Put the tahini in a small bowl. Stir in the cacao powder, agave syrup, and almond milk until smooth. You can stir in a little extra almond milk if it seems too thick. Dip the tips of the watermelon wedges in the cacao-tahini mixture, using a spoon to spread it up the wedge. Lay the slices on a parchment-lined sheet. Sprinkle with any toppings you want and take a bite!